Story: Ik-sang (Kim Roi-ha) is told to give a young woman a huge amount of money and in return get her cell phone, on which an incriminating video is stored. But Ik-sang is in deep debt and keeps the money. In order to get his hands on the cell phone anyway he contacts his brother Tae-soo (Lee Min-ki) after years, who is a psychopathic killer. Tae-soo kills the woman and kidnaps her little sister. However, he gives the girl a chance to escape as he wants to hunt her down afterwards. Na-ri flees to a house close by where mentally retarded Bok-soon (Kim Go-eun) and her sister live. But Tae-soo finds the girl and kills Bok-soon's sister, while Na-ri manages to escape once again. Bok-soon succeeds in temporarily incapacitating the killer, but he eventually disappears with the body of her sister. The police doesn't believe Bok-soon and is of no help. Thus, Bok-soon decides to look for the killer herself and take revenge. Meanwhile, Tae-soo is still looking for the cell phone and hasn't given up on his hunt for Na-ri either. Review: "Monster" is a movie that apparently likes to experiment a lot. This mix of a thriller and a comedy simply doesn't work out in the end, though, no matter how much you would like to turn a blind eye on certain aspects. For one this is because the violent scenes in the movie are extremely bloody at times and therefore make them contrast with the comedic moments to such a strong degree that you can easily call this movie a schizophrenic thriller. Concerning the story there has mainly been used a tried and tested plot, but there are a few elements, like the mentally retarded heroine, that bring something out of the ordinary into the thriller. In the end, "Monster" is an interesting thriller that yet alternates too much between two extreme tones of atmosphere and accordingly won't work out. No doubt, the individual parts work out quite well. The dark mood is captivating and especially the story around Tae-soo and his family is thrilling. Tae-soo is a monster and you simply have to detest him. But during the scenes with his family his past is touched on where he wasn't really treated well as a child, and accordingly there is at least one scene in which you actually feel sorry for Tae-soo! On the other hand it is easy to understand his brother and mother who are living in constant fear of him and would like nothing more than to somehow get rid of him. But Tae-soo is often used as a tool by them and you get the impression that Tae-soo might be a monster, but in the end is just looking for a little bit of love from his family. Director Hwang In-ho has already worked with Lee Min-ki in his debut work "Spellbound" and Lee delivers a solid performance here. He is normally cast in the roles of the young pretty boy, but there is something flickering in his eyes that makes him a good choice for the role of a psychopath as well. Actual star of the movie, though, is Kim Go-eun, who after her role in "A Muse" wants to prove her acting range. And she in fact is successful in that, although often enough she is only inches away from drifting into overacting. That is because her scenes as a mentally retarded are frequently very funny, which may be deliberately so, yet deprive her role of any integrity after all. That's the problem you will constantly run into with "Monster". A bloody murder is suddenly followed by a scene of Bok-soon and the ten-year old girl as they lie in each others arms crying after a quarrel on a kindergarten level. You have to laugh during the most impossible moments of the movie and that's irritating, even the more as they aren't unintentionally funny scenes. 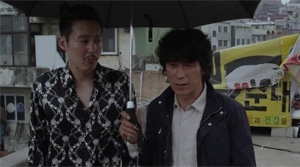 The way director Hwang tries to connect two extremes just can't work out since the movie isn't a black comedy in its core, but just a cruel thriller with some humor. The very gritty color range doesn't leave a doubt about that either. Also, the amount of blood and the finale won't make you suspect a comedy behind the events. There was a critic who objected the violence against women in the film, but actually the thriller just doesn't differentiate between man and woman - in fact it is quite "gender-neutral" in its approach. This point of criticism also isn't comprehensible because Bok-soon is actually a power woman in her own way. She doesn't have the mental capacity to think everything through, but that makes her even the more reckless and effective (at least so some extent), which becomes particularly obvious in the finale. Naturally, there are some clich�s in a thriller like "Monster" that are touched on. The story goes hand in hand with a lot of plot holes as well. Why the characters act the way they do isn't really understandable. Only Bok-soon and the little girl can't be blamed since they are by nature naive and dim-witted. Next to the family models introduced in "Monster" there are also some socio-critical references concerning the comparison between life on the countryside and that in the big city that manage to positively surprise. "Monster" is an atmospheric thriller with something special about it, but despite all the goodwill the humor just can't bond with the dark tone of the film. An odd, if not necessarily a bad thriller.